Halloween is easily my favorite time of year. Crisp autumn air, harvest flavors, and a palpable childlike excitement. 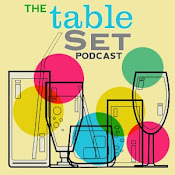 On the Table Set this week we're discussing our favorite Halloween parties past, spooky new ideas, and of course what kind of booze is the scariest to serve your house ghouls. While overall we decided moonshine was a pretty badass spirit for All Hallows Eve cocktails and punches, we also pondered making a pumpkin-infused bourbon for the purpose of a layered "candy corn" shot (lowbrow/highbrow! Classic ChocoMeat). The layering didn't quite pan out... but I took the ingredients I was working with and instead made a refined cocktail for more sophisticated costume parties to toast the night with. I had to include Strega (which means 'witch' in Italian), a bright yellow Italian herbal liqueur possessing a complex structure with fennel, mint and coniferous notes. I rounded the cocktail out with Royal Combier, a blend of Combier’s original triple sec, cognac and Elixir de Combier (a 19th century French hygienic liqueur which includes aloe, nutmeg, myrrh, cardamom, cinnamon and saffron). Combine all ingredients in a stirring glass over ice. Stir until chilled and [double] strain into a cocktail glass. Garnish with freshly grated nutmeg and a flamed orange peel. Cut 1 vanilla bean in half lengthwise. In a 1- to 1 1/2-quart jar, combine vanilla, pumpkin slices, and nutmeg. Cover with Bourbon (saving empty Bourbon bottle). Seal jar and rest at least 4 days or up to 3 months in a cool, dark place. Once desired flavor intensity is achieved, strain liquid through cheesecloth and funnel back into Bourbon bottle. I want that pumpkin liquor and I want that sparkling star glass!